China has approached Vanuatu about building a permanent military presence in the South Pacific in a globally significant move that could see the rising superpower sail warships on Australia’s doorstep. 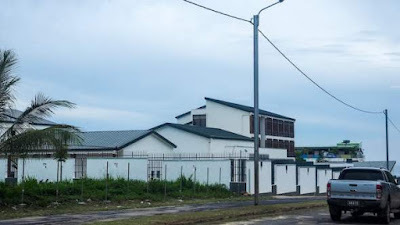 Fairfax Media can reveal there have been preliminary discussions between the Chinese and Vanuatu governments about a military build-up in the island nation. This news is causing alarm in geopolitical circles. You do not need to be an expert in naval combat to understand why Chinese naval bases in the South Pacific are proper cause for alarm. But here is the thing: the alarm has been sounding for a long while now. From atoll to archipelago it has wrung; its tones have echoed from one side of Oceania to the other. We have ignored it at every sounding. One must be careful with such statements: not everything done on this Earth is the consequence of American action (or lack thereof). But in the South Pacific we have acted amiss. We toot our way across its waters with a ludicrous level of complacency. My hope is that this news will shake some of us out that. But it may well be too late. The Chinese have delivered the lesson we deserve. A few caveats. The language employed by the Sydney Morning Herald is interesting. China "eyes" a Vanuatu naval base, we are told. "Eyes" is not "announces." The deal has not been made. We have no independent verification that it is even on the table. If it is, the Herald's source certainly isn't Chinese and probably isn't Vanuatuan. The most plausible source is an Australian agency opposed to the Party's expansion into the South Pacific. The leak is intended to shame and pressure the Party out of making a deal with Vanuatu. Nothing has been decided. Possibly nothing ever will be decided. Those of you who follow my twitter feed—or a bit rarer, those of you who I have had the privilege of discussing Chinese foreign policy with in person—know how frustrated this issue makes me. I have been writing about it since 2015. Pay attention, I have pleaded, to what is happening in these islands. Look at what is happening inside Vanuatu, Tonga, Fiji, the Solomon Islands (and to a lesser extent, FSM, Samoa, and America's own territories in the Western Pacific). No one has cared. Now we see why they should have. Today's headlines are the inevitable end of the changes sweeping through Oceania. The writing has long been on the wall. Aspects of my biography have given me a strong incentive to peer at this writing—a stronger incentive, at least, than most China-hands have. But this is not about me. I bring up my past moments playing Cassandra only because it is an example of how difficult it is to get Americans to care about what is happening to their pathway to Asia. I write up tweet storms on the Chinese student experience in America, or Chinese influence operations in Australia, and what I write goes viral. I do the same in response to events in Tonga or Kiribati.... and get maybe a retweet. Our priorities are screwy. We view the region with unconscionable complacency. We act as if the South Pacific has fallen out of history. We pretend we do not need to know what the people there do and think, who they owe money and favors to, or how they feel about America writ large. Too late we start to see the costs of our smugness and stupidity. 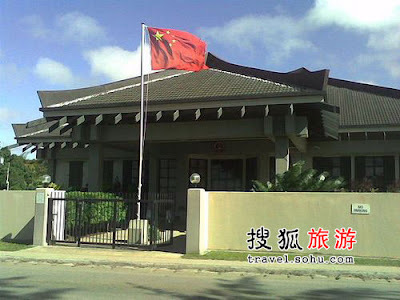 Source: Bob Markin, "China Opens New Embassy in Port Vila," Vanuatu Digest (27 July 2017). This one is less fancy. This is the PRC embassy in Vanuatu. It was constructed (along with the Prime Minister's office, a new wharf, the foreign affairs building, and a college) by Chinese contractors over the last two years. It opened for business last summer. That is right. There are no pictures of the American embassy in Tonga or Vanuatu. It turns out, the United States of America does not have an embassy in Tonga or Vanuatu. We are losing a game that we do not realize is being played. David Wroe, "China eyes Vanuatu military base in plan with global ramifications," Sydney Morning Herald (9 April 2018). Arguably it smacks of overreach, much as Guadalcanal, North of Vanuatu, was overreach for the Japanese. But until the actual shooting starts, the capabilities of basis can seriously restrict potential opponents actions, and force them toward certain actions. The Philippines may have been a far too forward for the Americans to defend effectively in 1940, but it did force the Japanese hand. The same would be true for the US in a future war, the existence of the base forces them to be acted upon.